If asked, how many days in 2016? It was 366 days, right? So, how about in 2017? In 2017, it will be 365 days a year which equals to 8760 hours. Everyone has the same days and times, and the time will not stop, it always flies from one year to another one. Looking back to last year, what I have done for myself, my family and country, and within this year what will I plan to do? The answer .... will be not shared here :-). Let me move to what I should say for Cambodian New Year 2017. As my country's official religion, Buddhist, and based on beliefs, the angel of the Year of the Monkey 2016 will transfer her duties to the angel of the Rooster 2017 that this year will be celebrating on April 14, 2017. 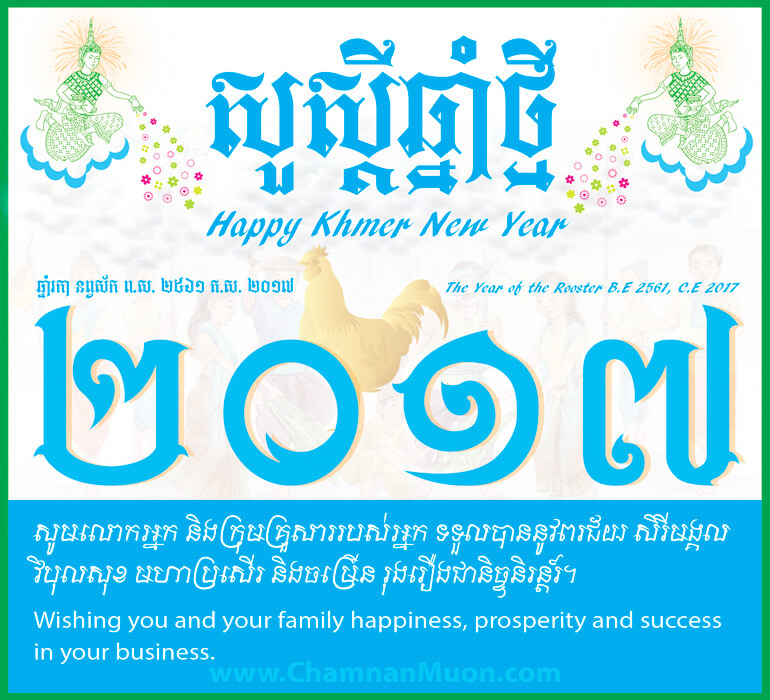 To take this valuable opportunity, I would like to say Happy Khmer New Year 2017 to all Cambodian people and the rest of the world, and wish you all the best for the upcoming Cambodian New Year 2017 to all my friends, colleague, families, beloved readers, and people in the world. Please, the Year of the Rooster's angel wishes all be blessed with a peaceful and prosperous living for the whole year through. The holiday lasts for three days beginning on New Year's Day, which falls on April 14 to 16 this year, that is the end of the harvesting season, when farmers enjoy the fruits of their labor before the rainy season begins. These three days called Maha Songkran for first day, Virak Wanabat for second day, and Virak loeurng Sak for final day. Places where I plan to visit? Almost every Khmer New Year's days, I always plan to visit my homeland in Battambang province, the northwestern of Cambodia. Have you gone to visit there? If you are interested, you can check out this article 'The Beauty of Battambang City'. I think not only me but also most Cambodian people who have come for study or work in the capital, Phnom Penh, will plan to travel back to their homelands to meet their families, relatives, and friends during these 3-day holidays. Oh, if you gonna plan to visit our well-known historical site, Angkor Wat in Siem Reap, you could go see a big event, អង្គរសង្ក្រាន្ត ឆ្នាំ២០១៧ - Angkor Sankranta 2017. It has been celebrated every year since 2013. You may need to book a bus? Check out this online bus ticket booking! Keep updates on the official Facebook page. So, where will you plan? If you still stay in Phnom Penh, you should go to join Sangkranta Wat Phnom at Wat Phnom Historical Site from April 14 - 16, 2017. 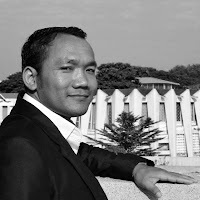 Check out the promotional video on the Facebook Page of Phnom Penh City Hall. My message for this year? Yeah, it is what I have almost every year to keep some messages for myself as well as for my beloved readers like you. So, what are they? Never give up on what I love doing: It is the same point as last year. The true is that people should do what they love, not only profitable or community-based activities, even though they challenge some problems, they gonna keep doing and doing, never say 'I have to give up'. Saying so, it is really easy, right? To do, it is NOT easy but it does not mean that everyone cannot do it. Do you think so? Let change, and keep moving: When heard the word 'change', it would be .... what it means to you? I cannot change this or that, why I have to change it ... I am in the comfortable zone now :-). It will be hard to hear on what someone told you in a bad feedback but if it is in a constructive one, it would be a bit easy to accept and change it, right? Personally, for me, both of them I always need it, listen to them because only that person who frankly speaks about it to you. If it is good for you why not start changing on the points. Changing in the proper way is the BEST to make it in order to jump out of the box. Free to smile, and always be positive: Smiling is FREE but it is not easy to make it from the bottom of your heart unless you are ready to do that. Try to do it day by day if you are not used to it. While doing that, it is really fresh and happy. Being positive is a MUST to do for me. For me, it is my nature, maybe, :-). No one is perfect on any area of life paths. Just try it, you will know, I am sure!. Love travelling, and taking photos around the country during the holidays? Please help spread your useful comments and photos on Google Maps by joining Google Local Guides program to let other explorers know the best places before they plan to go there. The messages above are just in the messages but ... to think and think, and to start taking action on it in order to make it come true. When it comes true, pleased do not hesitate to share it to other people too. រីករាយ ឆ្នាំថ្មី Rikreay Chhnam Thmei! Have a nice holiday! Any point not to mention above? Please let me know, and let share me your message or idea below.